H2H is a Korean brand designed for men and women offering slim fit style with the highest qualities. We bring customers to a different outlook on thier life of fashion. we are proud of our select and make high quality clothing from the policy that we devote all our attention to make the best one. Please enjoy our versatile products bring you simple & effortless style along with comfort. Also, It makes an excellent gift on any occasion. -It depends on the material, but most of the styles are tagged in Asian size and slim fit so sizes are one to two sizes smaller than US or EU size. Specially for T-shirt or Shirt. -If you are not sure about your size, please refer to the size chart and careful consideration before your decision. 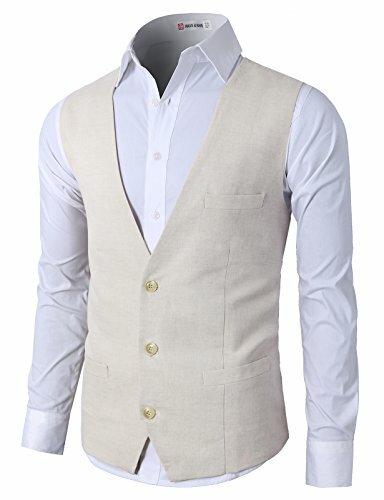 -Our Vests are Slim Fit. So If You want to loose fit, You Had Better Order One Step Bigger Size than Your Original Size. Also some review says size runs Small, suggest choose 1 size up if you don't wish tight fit. US Small (Asia M)-----Shoulder 13"---Chest 39"-----Length 24". US Medium (Asia L)------Shoulder14"----Chest 41"-----Length 25". US Large (Asia XL)----Shoulder 15"----Chest 43"-----Length 26". US X-Large (Asia 2XL)----Shoulder16"----Chest 45"-----Length 27". US 2X-Large (Asia 3XL)----Shoulder 17"----Chest 48"-----Length 28". US 3X-Large (Asia 4XL)----Shoulder18"----Chest 53"-----Length 28". Features : Adjustable back strap, 3 button down front, two real pockets for your watch,cards or handkerchief etc. Multiple Item : Casual but stylish way with your chino pants or dressy way with your slacks. / Occasions : Suitable matching with suit/long shirt dress, Well-Fitted for wedding, business, date, ball, graduation and other occasions. SiZE : Our products are Slim Fit, so If you want to wear loosely, we recommend you to choose one size bigger than your original size. COLOR : The color could be little bit different between on the screen and in practice. Linen is stylish & sensitive material. Dry cleaning or hand wash around by 86¢µ water without fabric condithioner recommend. Otherwise it could be change the shape.